Google has updated Quick Action buttons for Gmail with more new actions which was launched earlier in this year. Quick Action buttons lets you perform some actions without opening a particular mail, so you can open a link or check a flight details from the subject line. Now web users can access even more quick action buttons in Gmail. The Quick Action button will be placed on the right side of the emails. Other site actions included with an arrow button that lets you go directly to a page linked to in the message. 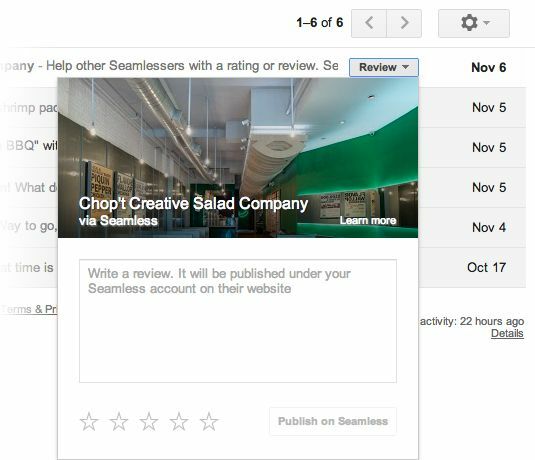 Users can rate and review restaurants on Seamless and view your OpenTable reservations. Also you can modify your dinner reservations from the inbox. You can do this action quickly by Review button. Not only the restaurants, you will review goods, movies, music or any other products. You can directly open files and documents from Dropbox, Google docs, sheets and slides from your inbox which shared via your email. Gmail now supports a variety of actions and the action buttons can be determined by the sender. The sender will select one of those action types and provide information to set it up correctly. Google is continuing to add even more quick action buttons to use Gmail easier, so Facebook, Twitter and other services will be connected on this feature soon.